Do you remember Martina and her 7-year-old Austrian Warmblood mare Louisa? 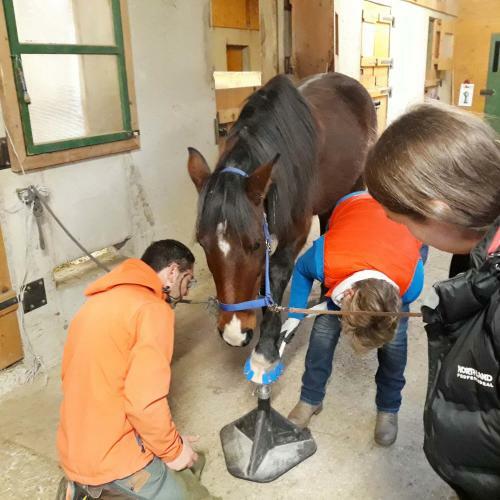 Because Luisa’s coffin bones are too deep in the hoof capsule, which was diagnosed via X-ray, and damage to her tendons, she was unable to move without experiencing intense pain. Her walk was weak and tense, and she limped over asphalt and frozen surfaces. 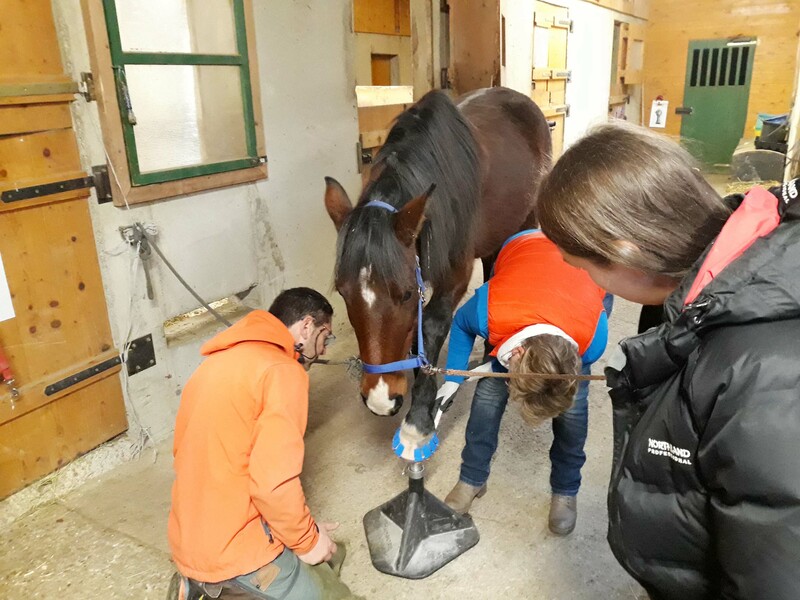 Five weeks ago, we visited them on our Mega-Tour and chose Luisa to try the Mega-GLUE System on all four hooves. 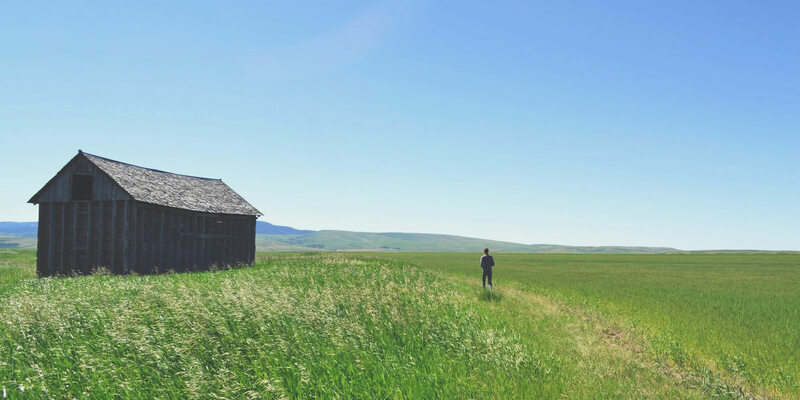 Today we’re going to tell you how these last weeks have been and what changed since our last visit. Not a wallflower anymore. Luisa is herself once again. After the first mounting of the Megasus Horserunners, with every meter, the brave warmblood mare moved with more ease and security. 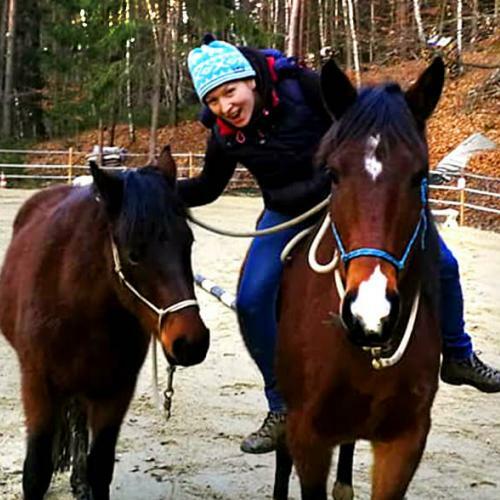 In the following weeks, while they were testing the Megasus Horserunners, Martina reported, that Luisa gained a lot more self-confidence in the herd and developed a totally new body awareness. These are the reports we want to hear! Our whole team had their fingers crossed for Luisa and wished for her to be able to move freely and pain-free. Because of her new joy for movement and a better quality of life, she gained a higher status in the herd. “In the past, Luisa sadly was separated from the herd and was mobbed by a pony. The Horserunners gave her new footing in the herd and Luisa is herself once again. Because she can move again, she also fought back against the pony!”, recounted a relieved Martina. Luisa and her hooves recover. 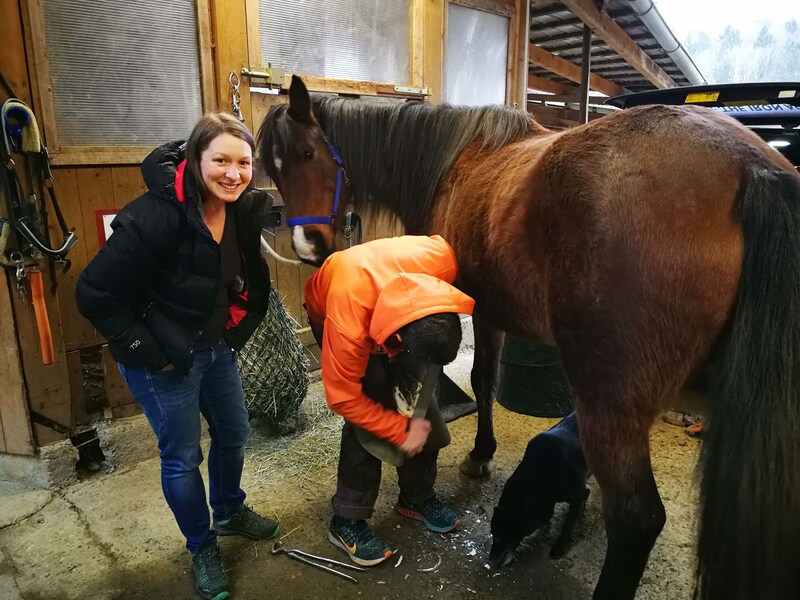 Last week, we visited Martina und Luisa so we could remove the Megasus Horserunners after a test period of four weeks to correct the hooves and glue the Megasus back on. What we found was a totally different horse: Luisa is keen, playful and self-confident, she moved around and presented herself with pleasure. When we got to work, we immediately noticed that lifting her hooves was no longer a problem. She lifted them all by herself and enjoyed the treatment from the Megasus Team. While we were correcting her hooves, our first impression was confirmed: Luisa’s hooves were able to recover. The soles were noticeably thicker and the horn grew in healthier, without inflammation or dents. Four weeks ago, we saw a slight canker, which has now improved significantly. Upon removing the Megasus Horserunners, a clean horn and a healthy frog were revealed. “Luisa’s hooves developed really well! 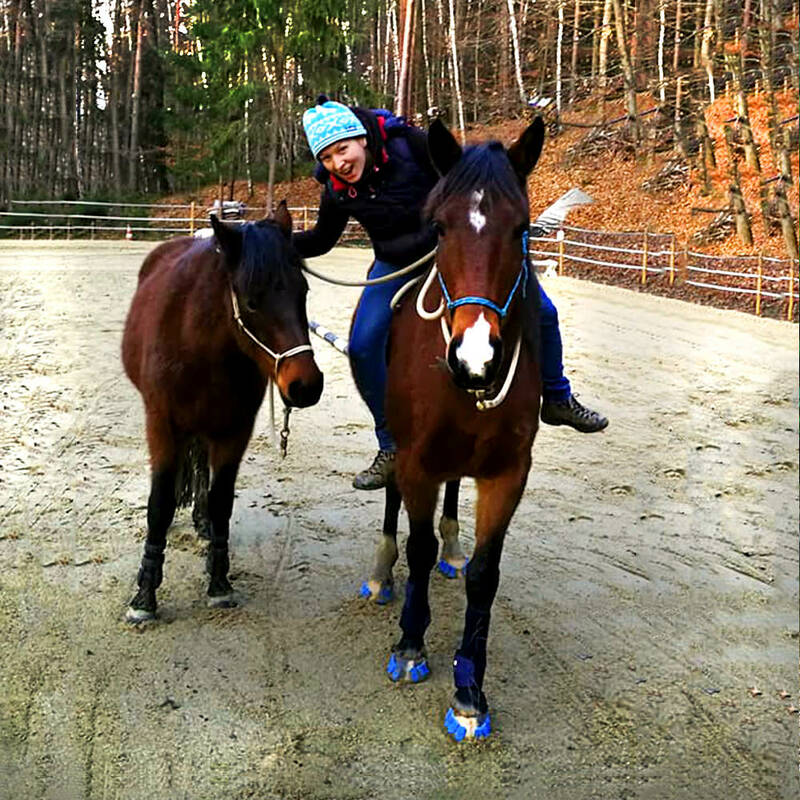 We are very satisfied with the recent regrowth and the direction of the hooves” said Charly Forstner excitedly, the inventor of the Megasus Horserunners, who mounted the Megasus four weeks ago. Charly was also pleased upon discovering a nice improvement to the heels. Not only Luisa’s hooves have improved, but also her charisma and her whole body seems more relaxed. In the last few weeks, we were able to lay a foundation for Luisa, on which we can further build on. After four weeks of testing in muddy paddocks, Luisa’s Horserunners were in perfect condition and were re-used and glued on again after changing out the Side-Clips. We decided to go with the Mega-GLUE System again because of the current weather conditions. Luisa walks a lot on muddy surfaces and needs to have 24/7 protection for her recovery. 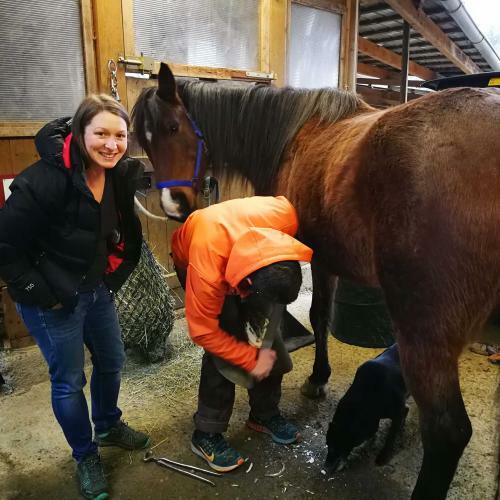 The Megasus Horserunners were glued on all four hooves and filled with a gel, so the Megasus would be especially comfortable for Luisa to help her on her journey to healthy movement! We wish Martina and Luisa all the best and look forward to our next visit!